Dining Room 10'11 x 10'6 (3.33m x 3.2m): having a double glazed bay window to the front, panel radiators, coved ceiling and telephone point. Cloakroom: having an obscure double glazed window to the side, panel radiator and a white suite comprising a low level WC and a wall mounted wash hand basin. Bedroom One 11'9 x 10'10 (3.58m x 3.3m): having double glazed windows to the front, panel radiator, wooden floor, television point and feature fireplace with electric fire. Bedroom Two 11'4 x 11'0 (3.45m x 3.35m): with a double glazed window to the rear and a panel radiator. Bedroom Three 8'0 x 7'2 (2.44m x 2.18m): having a double glazed window to the rear, wood laminate flooring and a panel radiator. Bathroom: with a Velux window, panel radiator, chrome radiator/towel rail, spotlights and a white suite comprising of a low level WC, wall mounted wash hand basin and a panel bath with electric shower over. Outside: the fore garden is laid to gravel with a paved path leading to the front door. The rear garden is enclosed by wood panel fencing and is laid to block paving with gated access to the rear and a Garage 18'0 x 10'4 (5.49m x 3.15m): having an up and over door, power, light and a door to the garden. Disclaimer - Property reference GPJLIMEST. The information displayed about this property comprises a property advertisement. Rightmove.co.uk makes no warranty as to the accuracy or completeness of the advertisement or any linked or associated information, and Rightmove has no control over the content. This property advertisement does not constitute property particulars. 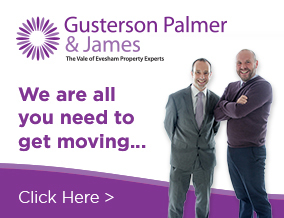 The information is provided and maintained by Gusterson Palmer & James , Evesham. Please contact the selling agent or developer directly to obtain any information which may be available under the terms of The Energy Performance of Buildings (Certificates and Inspections) (England and Wales) Regulations 2007 or the Home Report if in relation to a residential property in Scotland.